Kunzea ambigua is known as the White Kunzea and is usually an erect or spreading shrub that, in our cold climate garden reaches a height of three metres. Small aromatic leaves are tightly clustered along the branches. White fluffy flowers cover plants in late spring and early summer. The flowers attract a wide range of native insects including bees, beetles and wasps. Honeybees do not seem to be attracted to the flowers. Plants respond positively to pruning after flowering. In our cold climate garden, we find seedlings appearing regularly. The species is common in bushland in Eastern Australia from New South Wales through Victoria to Tasmania. We propagate the White Kunzea from cuttings with no problems. There is also a pink flowered form. We also have a semi-prostrate form that develops into a mounded ground cover. 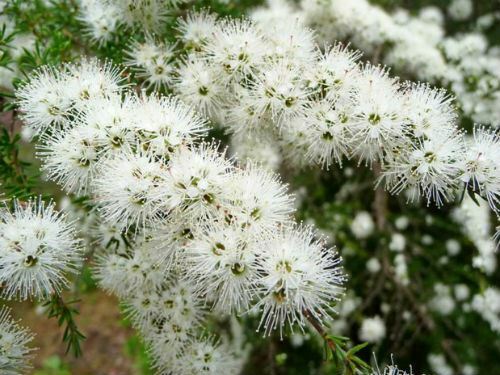 We have fond memories of Kunzea ambigua. This was the featured plant at the first meeting we attended of the APS (ASGAP) at Glenbrook in the Blue Mountains over 45 years ago. The meeting was in late spring and the White Kunzea was lighting up the Blue Mountain’s bushland.